Begin your holidays to the most exotic destinations in the world Nepal which is also known as the Roof of the World with the arrival at the Tribhuwan International Airport where one of our representatives will receive you and help you to settle down in the pre-booked hotel. Start your day with a delicious breakfast and then proceed for the sightseeing tour of Kathmandu, the cultural capital of the country. First, visit the most revered Pashupatinath Temple which was built in 1696 by the King Bhupendra Malla. Constructed in the pagoda style of architecture it stands on the banks of river Bagmati is a UNESCO World Heritage Site. 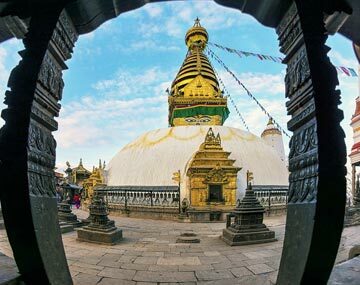 Next visit the Bouddhanath, the holiest shrine for the Buddhist culture along with its large stupa and then proceed towards Patan which is also known as Lalitpur. It is the second largest town in the valley and is quite famous for its architectural beauties. Visit the Durbar Square which is the tourist heart of Kathmandu which surprises its visitors by its number of temples and two adjoining squares. The jewels in the crown are the Hanuman Dhoka, Taleju Temple and the Kumari Bahal in which the living Goddess, a young girl selected from Kathmandu Valley still lives. After some rest visit Bhaktapur where you can see the Tibetan Refugee Center from where you can bring the finest quality of Tibetan carpets. Later in the evening proceed towards Swayambhunath Stupa which is found on the hilltop to the west of Kathmandu. The complex was founded by the king Manadeva during the fifth century contains a stupa, temples, shrine, museum, library and a Tibetan Monastery. After enjoying the whole day return back to the hotel for dinner and overnight stay. On this morning of your Pokhara 2 night package check out from the hotel and fly to Pokhara which takes 30 minutes by flight from Kathmandu. Upon arrival, check into the pre-booked hotel and take some rest. Later on enjoy the splendid beauty of Pokhara which is surrounded by some of the highest mountains in the world Dhaulagiri, Manaslu and Annapurna. For many trekkers, it is the gateway to the Himalayas. Enjoy dinner and overnight stay at the hotel. After relishing your breakfast fly to Jomsom, a small village situated in the mountains with only basic accommodation facilities. The aircraft is Twin Order or Donair with the seating capacity of 15-20 seats. Upon arrival, check into the pre-booked hotel and take some rest and then visit the Muktinath Temple. Visitors have to walk for about 15-20 minutes over the Kali Gandaki River. There is no mode of transportation over here and after crossing the bridge take the jeep on sharing basis for Muktinath which takes around 1.5 hours to reach it. Upon arrival at Muktinath there is another 30 minutes walk from the base of the temple. After darshan follow the same route to reach Jomsom for dinner and overnight stay at the hotel. On the 5th day after breakfast fly back to Pokhara. Upon arrival check into the pre-booked hotel and take some rest. After lunch visit the Bindebasini Temple which is one of the oldest temples of Pokhara with the main deity of Goddess Durga. Also visit Devi’s Fall and Gupteshwar Cave which is popular for its limestone deposits etc. Return back to the hotel for dinner and overnight stay. On the 6th day of your Pokhara Tour Package by flight proceed for the excursion trip to Sarankot which is among the most popular destinations that offer splendid views of Pokhara Valley and its mountains. It can be reached easily by 45-60 minutes by a car and is renowned for its amazing sunrise views. Paragliding is also among the major attractions among tourists. On a clear sunny day, visitors can enjoy the spectacular views of Dhaulagiri Mountains and Annapurna range. After enjoying the scenic beauty of Pokhara fly back to Kathmandu and transfer to the hotel for dinner and overnight stay. The last Day in Kathmandu will be comparatively free and closer to the time of your flight you will be transferred to the airport to board a flight for onward journey. If you want to enjoy your holidays in the lap of Mother Nature in the calm and serene surroundings, then Kathmandu the capital and the happening city of Nepal is just a perfect destination for you. Full of mesmerizing bounty, exotic temples, simpleton people, delectable delicacies and the amazing atmosphere is just waiting for you. So hurry! Book Nepal Package with BookOtrip and enjoy an unforgettable experience of your life. BookOtrip is your trusted travel partner which leaves no stone unturned to give shape to your travel dreams no matter where you want to go. We offer you the best deal vacation packages, flights, hotel accommodations, car rentals, travel insurances etc.. so that you can enjoy a hassle-free journey to your desired destination. Transportation Jomsom – Muktinath – Jomsom by a non A/c Jeep on SIC basis (12 pax in a jeep). Or clients can take an independent jeep at an extra cost. Do ask for the cost. “ACAP PERMIT” ( Annapurna Conservation Area Permit ) for Foreign and Indian Nationals to be collected from ACAP office in Kathmandu & Pokhara. Failing to obtain the ACAP permit at either KTM or PKR will require paying double the amount as a penalty at Jomsom. A copy of the passport and 2 copies of passport size photos are required while applying for the permit. Confirmation of booking is only based on written communication. My mind got refreshed by this holy tour to Kathmandu. After this tour I totally changed to a new person with a clear mind and clean vision. Thanks BookOtrip for all arrangements you made there for us.